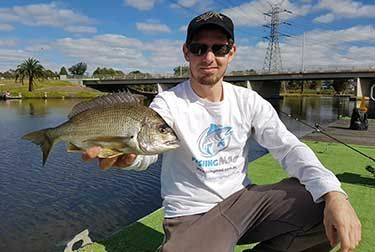 Alan Bonnici, Michael Smith and Jeremy Ang fished the Maribrynong river. Fishing was really tough due to recent rain which had the water discolored and the fish uninterested to take the bait. After a few hours I only managed to land a few decent Bream. We did have a large run of tiny Bream ranging from 10 to 15 cm. To our surprise we saw a large snake calmly swimming in the water next to us. That will be the last fishing session of the year.